The UE-405 is from the 80ies and offers a compressor, chorus, a parametric equalizer as well as a bucket brigade Delay – completely analogue and optimized for guitar. AT last there is an additionl ’empty’ slot which can be filled with an external effect using the Send/Receive jacks. The order of the fx can be interchanged with 5 rotary switches. Although named ‘Instapatch’, the patching is not that ‘Insta’ – you need to turn some dials for getting the new order – a neat feature nevertheless. If two fx try to occupy the same slot you will get warned by a flashing ‘Insta-Patch-Error’-LED. The ‘Stereo Chorus’ is not really Stereo, … but it sounds beautiful and thick. 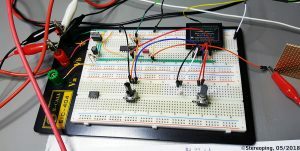 It’s based on the MN3007 BBD-ICs also used by the Roland Dimension D (the Dimension D additionally uses NE570 Compander ICs). The max. time of the delay is 300ms. Normally this unit comes with a floorboard offering 5 footswitches to turn the FX On/Off and an additional Master On/Off. Without this footswitch the fx are all Off after firing it up – not so useful. The wiring of the original jack for the footswitch-board is not very complicated, the web is full of pics about it. As the jack does not seem to follow any standard i just cut it off, made a plate of the same size and populated it with 5 switches. The benfit is you do not need to drill holes into the case. For all switches one of the outer pins goes to ground (magenta cable of the Ibanez) and the middle pins will be soldered over a 10k resistor to +15 V (blue cable of the Ibanez). All 5 FX-ON/OFF-cables also go to the middle pins of the switches. The cables are connected to GND or to the 10k resistor going to +15V. According to the sIbanez schemes the cables are flipped between GND and +15 in the floorboard but i wanted to go save, it works as well. If you prefer you can also solder the on/off cables directly inside the Ibanez to keep them permanently on. pins for Depth A&B shorted: very short reverb time, more like ambient. Fewest noise. pins for Depth A&B over 10k: long reverb time. More noise. TO keep the Ibanez as unmodified as possible i wanted to plug the reverb into it’s Send/Receive path. 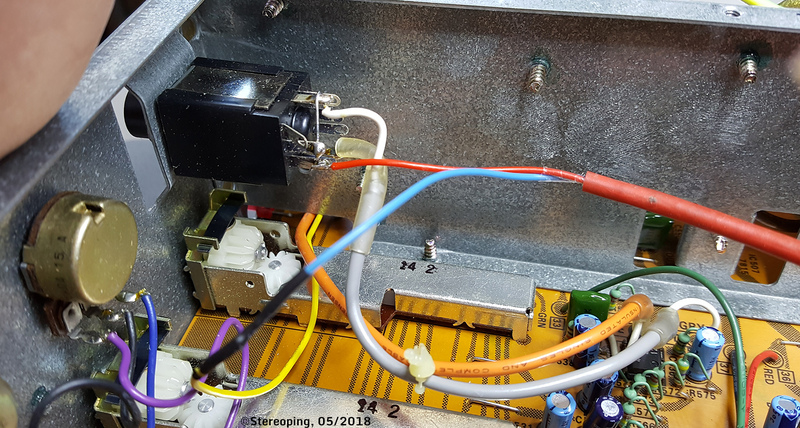 The jacks got internal switches – if nothing is plugged int o it the reverb is used. It’s perfectly possible to still plug external FX into it, the reverb will be disconnected then of course. 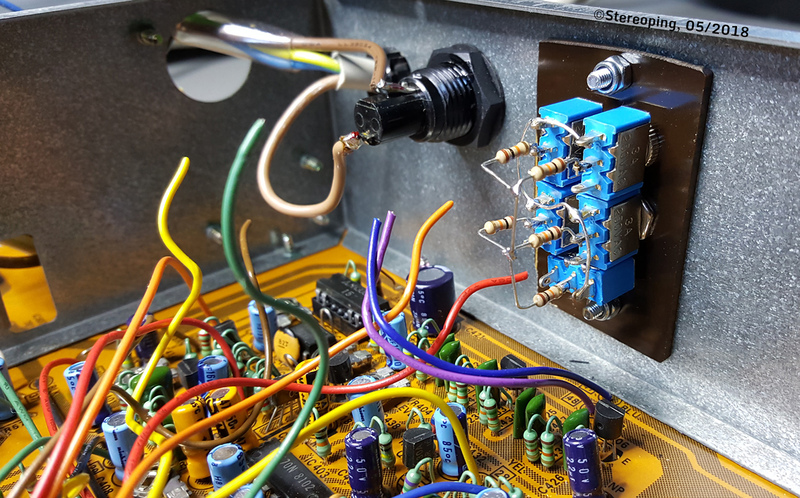 The yellow cable of the SEND-jack (goes over to the switch of the Receive-jack) will be desoldered and connected with the OUT (blue cable in the picture) of the reverb. The input of the reverb (red cable in the picture) is connected to the lower pin of the switch pins. The upper switch pin will be connected to the white cable (Send of the ibanez) with a wire.